This tour begins with a scenic boat ride through Nassau's harbor. In the Dolphin Swim Program, you receive the unique opportunity for playful, educational interaction with these wonderful animals in the beautiful turquoise waters of our natural ocean lagoon. Your program to swim with dolphins begins with a fun orientation, briefly covering the natural history of dolphins, animal training techniques, ocean conservation and Watchable Wildlife Guidelines. Once in your lifejacket, experience the joy of a dolphin kiss and fall in love with their gentleness as you hug a dolphin in your arms. Dance and sing with our stars then marvel at the dolphin's strength as you are propelled across the lagoon in the finale behavior --- the footpush! 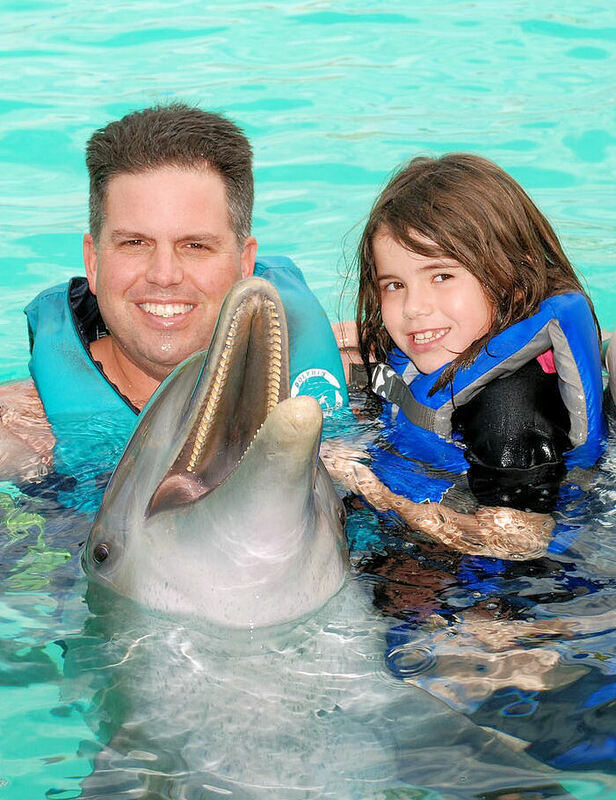 In this program, trainers focus on allowing everyone to enjoy a high degree of interaction with the dolphins, and at the same time, teach you about these amazing animals in their natural habitat. You will be in water with the dolphins for approximately thirty minutes. Please note no alcoholic beverages are allowed on property. Guests ages six to twelve must be accompanied in the water by a ticketed parent or guardian and be at least eighteen years old. Guests ages thirteen to seventeen must be accompanied by a parent or guardian with a ticket to sign the liability waiver. Approximate cost of the taxi to reach the tour departure area is five dollars per person and is about a ten to fifteen minute ride depending on the traffic. Please note we will provide full assistance for manual wheelchairs including providing wheelchair access into the water (with our waterproof chair) for the Dolphin Encounter program. For boating purposes, motorized power chairs and noncollapsible wheelchairs are not allowed on our boats. Guests must have the ability to go up and down ladders to access platform. Guests, age six (6) to twelve (12), must be accompanied in the water by a responsible, paying adult with a ticket for the swim. Parent or guardian must be at least eighteen (18) years of age. Guests between the ages of thirteen (13) to seventeen (17) must also must be accompanied by an adult (with a paid ticket) to sign the liability form. (At least one adult must accompany children under the age of 13 in the water.) Pregnant women will not be allowed in the swim program. Guests, age five (5) or younger, are not allowed in the swim program; however, may observe for free if attended on the dock by a responsible parent or guardian with an observer ticket. Alcoholic beverages are not allowed on the property. You will need to obtain a taxi from the front of the cruise ship pier for your transfer to the Paradise Island Ferry. Approximate cost of the taxi to the tour departure area is $5.00 per person and is about a ten to fifteen minute ride depending on the traffic. This tour goes rain or shine! Lunch is available for purchase. Beach closes at 4:00pm.